Arrival at the Camp. Welcome drink on arrival followed by Lunch and camp orientation & briefing. Post lunch indulge in camp activities such as Rock Climbing, Rappelling, Beach Volleyball, Beach Cricket, Kayaking etc. In the evening laze over a Bonfire or try your hand at fun games followed by a sumptuous dinner specially prepared by our Chef. 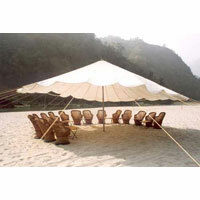 Tuck into your Deluxe Tents at The Camp 5 Elements. Wake up early to enjoy a refreshing Nature Walk with our guide. After a hearty breakfast change into our rafting gear and proceed for rafting on the river Ganges. You will end ever to complete 2 stretches on the river today. The first session includes the stretch from Marine Drive to Shivpuri covering thrilling rapids like 'Black Money', 'Three Blind Mice', 'Crossfire', 'Body Surfing', and 'The Shivpuri' rapids. Lunch will be served at Shivpuri on the river beach. 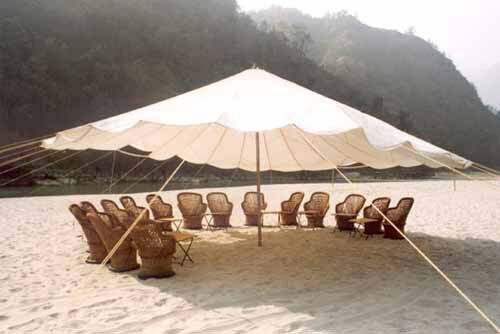 Post Lunch you will proceed for the second session of rafting from Shivpuri to NIM Beach. In this stretch one has to negotiate some famous white water rapids like "Return to Centre", "Roller Coaster", "Tee Off", "Golf Course", "Club House" and others till NIM beach where the days' rafting comes to an end. Late evening arrive at The Camp 5 Elements. Bonfire with our guitarist, Dinner and overnight at The Camp 5 Elements. You have another very exciting day on the beach. Amongst the many options, you can soak some sun, relax on the beach with a book from our library, try your hands at Kayaking, climb a rock, rapple down the river or just play a sport; baseball, badminton, volleyball, cricket, hiking. After an early breakfast start your trip from Kaudiyala downstream. The first rapid you hit is called the Daniel\'s\' Dip (Grade IV). The next big Rapid is The Wall (Grade IV+). Between these two there are some Grade II and II+ rapids with long float stretches with enough options to do body surfing as well. These rapids are the most exciting on the river. Rafting ends at Marine Drive with sumptuous Lunch. Post Lunch depart to your next destination.